The Gewurztraminer Wintzenheim is now traditionally made from a blend of our young vines from the Hengst vineyard (planted in 1978 and 1985!) and a very old vineyard located on the gravely valley floor soils near the village of Wintzenheim (planted in 1947). The gravelly soils brings the richness and often quite a lot of noble rot, while the calcareous/marl soil contributes more towards the structure, acidity and ageing potential of this wine. It never is as quite aromatic as the Turckheim, but often ages better and develops more spicy flavours. In 2007, both vineyards were harvested at a very high level of ripeness and significant noble rot, certainly influencing the fermentation speed and profile. The late vintage character made the fermentation stop at a lower than usual alcohol level and quite high sweetness, typical of a Vendange Tardive. 2/2009: the nose is surprisingly already mineral and dense. 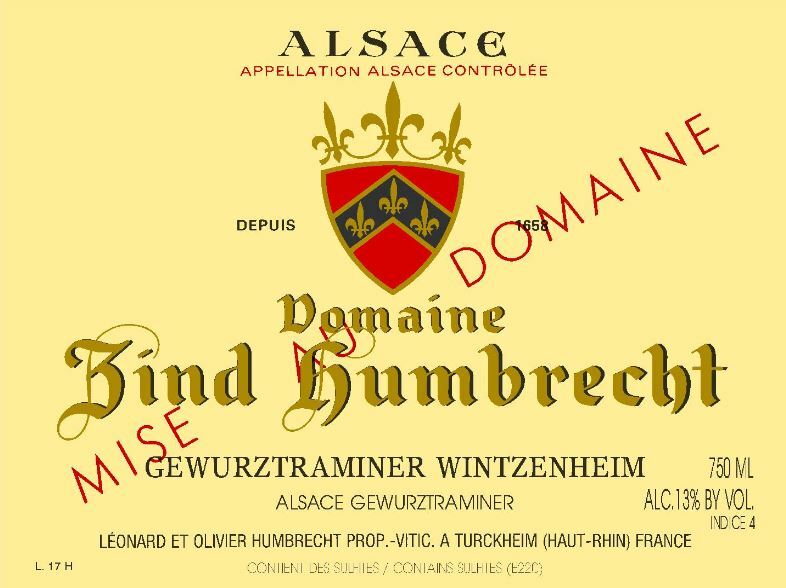 This is not the usual floral type gewurztraminer. It shows rich leather, spicy, nutmeg aromas. The first sensation on the palate is delicacy and harmony. The lower than usual alcohol allows the wine to behave gently. There is sufficient back bone and acidity to allow the important residual to taste harmonious and elegant. This wine appears lighter than one would expect, but the real richness shows on the long finish.